Pretty Little Liars has just shown its 18th episode (leaving four more till the end of the first season) and I must say that the second batch is just not as compelling as the fall shows. I’ve started paying closer attention to the clothes and accessories (and have started watching the first ten episodes just to focus on the PLL fashionscape). The following are my favorite pieces and only Hanna, Aria and Spencer make the cut (while I find Emily the prettiest, her sporty lifestyle leaves me cold). I loved Hanna’s sequin-embellished top but I seriously lusted after her green OR by Oryany hobo. She must’ve used this for about three episodes and I like how the bag appears to fulfill both function and flair. The top is more social than school but if you’re Queen Bee, you can work it with such aplomb. I wish the actress who plays Mona played Hanna instead; Ashley Benson has little of the Mean Girl/glamazon vibe. 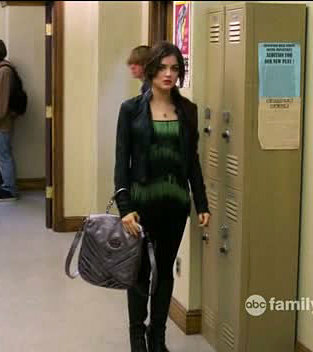 Aria’s green fringed top is as noteworthy as her convertible Elliott Lucca bag (which she used for over four episodes). Both pieces can be worn straight from school (or work) to dinner and drinks to wind the day down. Spencer stepped up in the sartorial department with this ’20’s inspired ensemble. The cloche-style hat, the grey vest, lace skirt and burgundy scheme – preppy meets vintage. The Juicy Couture cape Spencer wore when she paid a visit to Toby is another excellent piece. My only frustration is, one rarely needs such capes in tropical Philippines (one usually needs a raincoat).